My worst fears were validated in the Sydney Morning Herald (I gotta stop reading the newspaper) in an article entitled Happiness is … sleep, about funnily enough, sleep as the path to happiness. I can vouch for this hypothesis – I am constantly evading the Sandman and his stardust, and as a consequence I find myself unhappy, so it is obvious and pretty much self evident that the inverse must be true. However, sleep is one of those elusive things that is so hard to fit in to get enough of. As much as I’d love to spend my life in a cycle of just sleeping and working, it just doesn’t seem to work out for me. The problem is, I think, that my working life is so lacking in intellectual stimulation that I find myself or my head at least, yearning for some kind of fulfilment and in an effort to fill the un-fillable it seeks by way of an omnivorous appetite to devour information in an effort to obtain sustenance and meaning – even if at the cost of happiness and physical health. Sleep does appear to have detrimental affects on metabolism and I pay the cost in more ways than just extreme bouts of fatigue – I crave sugar and junk food constantly to feed my body in its bio-rythmic shock. Although admittedly after some period of sustained self induced sleep deprivation my body revolts and forces me to get enough rest – like last night. I felt pretty good today and it has been a very long time since I’ve been almost enthusiastic about my day. I want too much, I can’t have alertness and semi contentedness while also wanting more time. That damned Sandman always demands the debt be paid in one way or another. I heard, I think on one of the Radio National – All in the mind podcasts that some very intelligent individuals in scientific circles are indulging in cognitive enhancing drugs, which some, like Ritalin allow for prolonged wakefulness. Yet others can enhance memory, so increasingly these types of drugs are being abused by the intellectual elite, university students and perhaps even secondary schooler’s to enhance performance, much in the same way as athletes use drugs to gain an edge. I’m far removed from such elitism but I can definitely understand why some would want to use these substances to allow increased cognition over greater periods of time. Some would probably be outraged if they learned that some leading intellectual was partaking in a little boost but it doesn’t phase me in the least – hell I’d even be inclined to use them if I were in another time and place but the strongest drug I’m willing to indulge in right now is caffeine and nicotine. Not brainstorming chemicals but they will have to do for this tripper. But sleep may probably be the best cognitive enhancer I have at my disposal – too bad I don’t use this little helper more often but my livelihood doesn’t exactly require too much exertion on my old noggin. Of course the cure will be repackaged drugs from yore – namely meth amphetamine – the old Black Beauty will resurface and a whole new generation will be feeling tweaked at their computer desks, geared up and ready to go. Chronic Sameness Fatigue will be a thing of the past, although the murder rate will invariably increase after office tweakers fall into drug induced psychosis but that will be for another ad campaign and a revival of Largactil and for the hip – Zyprexa. The Largactil shuffle will be a hit dance club anthem to drool and shuffle about to, on the dance floor. Happiness – Friend or Foe? Posted by TwistedTripper Comments Off on Happiness – Friend or Foe? I’ve seen them. so dark. Black. And yet fine. Happiness – that age old question: Are you happy? It’s a question that was recently asked of me along with another; Are you fed up? Two serious and poignant questions which simply can be answered with a No and a Yes. However, can they so easily be dismissed with yes and no answers? In many ways they can but they almost certainly demand some level of justification or rationale. Happiness is seemingly the state of being that we agonise over, wondering if we are happy or if something other can enhance or bring us closer to it, constantly luring us with pining for its sweet embrace. It’s an obsession for many and I’m sure all of us have pondered at some time or other whether we have achieved happiness. I have and when I do I almost always conclude that I have not, hence why I squirm when someone asks me if I’m happy. I sense it’s a trick question only because of the uncertainty, of not knowing what it actually means to be happy or rather in what context am I to answer if I’m happy or not. That I think is what’s so disconcerting about the question. Happiness to me is a fleeting feeling, moments can be happy but to have extended happiness as a whole sum of life experience seems to me an unattainable goal, although admittedly even that is not entirely honest. Lasting happiness is attainable but it requires concerted effort in achieving or finding it and it is this effort, the enduring battle with the forces that conspire against it, that forbids my passage onto the shores of happiness. I don’t doubt that some people or maybe even a vast majority can find wholly a sense of happiness but I don’t believe that I can, well not in the current mindscape I envelope myself in. 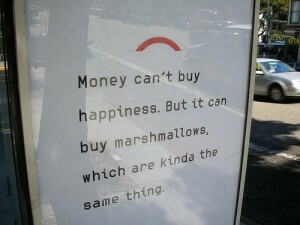 Again it seems to me a contextual question, happiness in what form? 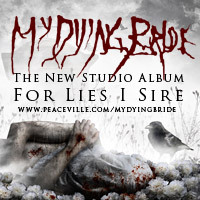 The quote from the Turn Loose the Swans album by My Dying Bride that I started this post with, sums up the quest for happiness; insofar as, for the most part, happiness is something which all too often is sought from the outside and from where I stand it most definitely is an internal dialogue more than anything else. I could give a dozen reasons why I am not happy and conversely I could give a dozen more why I am. There is truth in people choosing to be happy even if it sounds silly and counter intuitive. I fall prey to externalisation and as a consequence there is always something better or something I don’t have that will quell the sense of contentment and fulfillment that happiness promises. Looking for this next thing automatically gives rise to the fed up feeling. Like a pendulum it swings back to wanting something else, to and fro it swings and it may not be a bad thing if one can use the momentum to drive or affect some course of action or change but for the most part it just hypnotises me and I do nothing. Happiness I think begins with the belief that one has enough, if that belief can be sustained then it can form a base for gratitude which is a fundamental ingredient in happiness. The rest of the happiness equation is community and giving or service. Participating in community and feeling a sense of purpose and belonging is pretty much the core of who we are and it isn’t a stretch of the imagination to envisage that giving will be natural in such an environment. The formula seems easy and simple, although I should hasten to add that it isn’t something I’ve invented, but the way society is structured it has become difficult to establish an environment where the key ingredients to happiness – gratitude, community (friendships) and service are easily attained if it was ever easy. Consumerism and feeding the machine has replaced the tribe to large extent, or driven it to something to fit in if you have the time. Happiness is now commercial and I think we’re sold to the idea that chasing the next thing is in fact what happiness is. 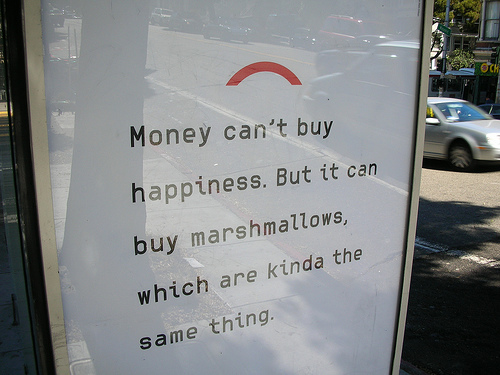 Like the marshmallow above, it can kinda be happiness, in a happy meal type of way.